Chassis: ThunderRoad rides on a 1 3/4 tube chassis and cage, sprung with Posies SuperSlide springs in the rear and POSIES Ellipta Slide Springs in front. A small-diameter steel driveshaft from Mahar Driveshaft, connected to a Winters Mini-Banjo with 3.73 gears/wedgelock, gets the wheels turning and disc brakes from Wilwood slow ‘em down. Borgeson changed the ratio on the ’56 Chevy steering box. 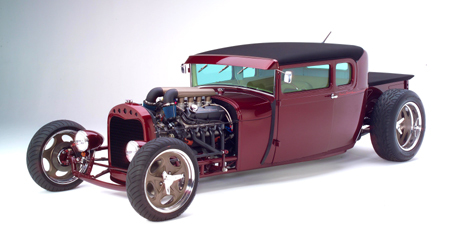 Body & Paint: The steel body is the only genuinely old-time component on the vehicle, modified with a 5 3/4-inch chop to the top. Hinges and door handles were retained, along with the cowl gas cap. 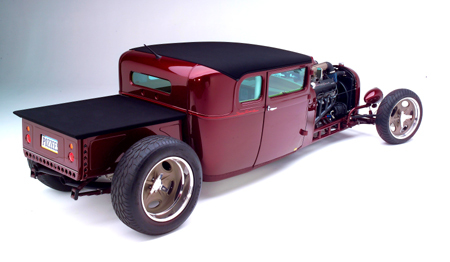 The tonneau-covered custom bed is built from aluminum. The CW Moss grille is flanked by H2 Hummer headlights in flea market buckets. 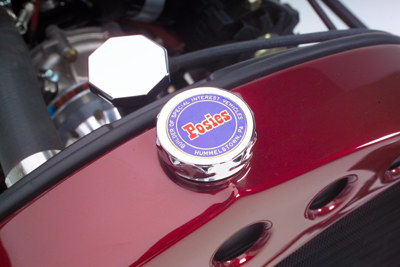 The .080 aluminum visor and .120 aluminum fuel tank were built at Posies. The rearview mirrors from Valley Auto feature ’57 Chevy heads on tapered stainless rods that are adjustable. Ken can extend them five inches for highway use, and loosen a wing nut to push them in close to the visor during shows. The burgundy paint is a PPG factory mix, chosen for the fact that it is not obscure or exotic. And the LED third brake light? “I’ve never built a hot rod–and never will build another hot rod–with a third brake light–but if I’m professing 2004, it needs to have them. The rear suspension uses a full spring on the bottom and an quarter elliptic on top. The system is adjustable with a nut and screw set-up to allow up to 2 1/2 to 3 inches of height adjustment. Note the custom C-shaped hangers that captivate the springs. The custom headers were hand fabricated at Posies from 90-degree mandrel-bent primaries connected to a main pipe that continuously tapers from 2 to 2 1/2 inches and connects to the exhaust pipes at the firewall with ball flanges. The headers were coated in black HPC. Mufflers are from Flowmaster. The quarter elliptical springs on the suicide front end act like the lower half of a four-bar suspension set-up. The leaf springs take the place of the lower bars and the adjustable upper diagonal rods above them act like the upper bars. The springs and diagonals do all the suspending in front; the shocks ride for free. After the top was chopped, the roof was raised 5/8 of an inch above the door openings to raise the roofline and reduce the flat surface. The cowl was raised the same amount and the top of the windshield was radiused 5/8 of an inch underneath the visor. The grille shell was lowered over the radiator and leaned forward 3/8 inch to provide a little more of a rake to the profile. The aluminum bed is protected by a cage built from 1 3/4 tubing, the same as the cab.